According to a report published by MarketWatch, sales of the Apple Watch have dipped by a whopping 90% since opening week. The data has been gathered by Slice Intelligence - a Palo Alto-based market research company. 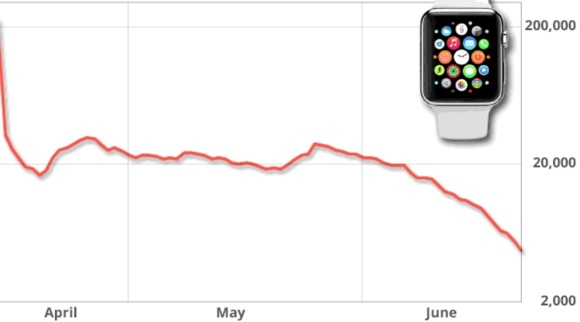 Apparently, the Cupertino less than 20,000 wearables a day since the strong start of the sales in April. Apple sold about 1.5 million smartwatches in the opening week of sales, which kicked off on April 10. Rather unsurprisingly, two thirds of the sold Apple Watch devices have been from the entry-level Sport family. Fewer than 2,000 buyers have splurged $10,000 and up for the gold Edition variant. Slice Intelligence has based its research on millions of electronic sales receipts which Apple sent by email after a purchase. The Cupertino tech heavyweight has so far been quiet on the sales performance of the Apple Watch. Earlier this month, an analyst predicted that demand for the device will indeed slow down. While the sales of the Apple Watch might come across as weak, it is all but certain that the device performed better than any of its smartwatch rivals. The wearable device is the company’s first new product category launch since the passing of Steve Jobs.